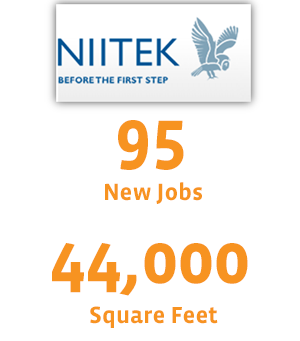 NIITEK, a division of Chemring Group, was already a successful Loudoun business when it explored expansion options in 2009 and 2010. The company was founded in 2000, and has experienced tremendous growth through the successful launch of its ground-penetrating radar systems. NIITEK is now an established world leader in lifesaving mine-detection technology, and its systems have proven invaluable to U.S. and Coalition Forces in Afghanistan. As orders for NIITEK systems grew, Loudoun County Economic Development already had an established a working relationship with company CEO Juan Navarro. NIITEK was not only as a successful business, but a good corporate citizen, always looking to partner with other organizations in the county. In one instance, the Department of Economic Development played a key role helping NIITEK find a Loudoun County manufacturing partner, and that partnership has thrived. Once facility expansion discussions began, Hargan assisted NIITEK early in the process of their decision to maintain a Loudoun headquarters, and to expand into additional research and development space a year later. In the end, Loudoun’s technical talent was a key decision factor for CEO Juan Navarro.